There have been sinkholes in clermont. Elevation between 100 and 300. 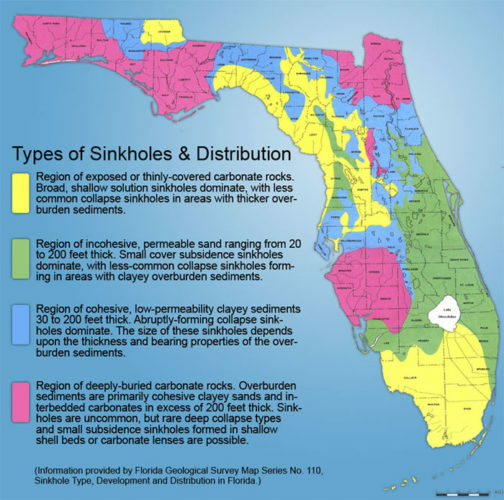 On this map there are some areas where there are few or no sinkholes. Wonder what differs there. Last edited by graciegirl; 06-17-2015 at 07:24 AM. Seems that would be catastrophic and that is covered by homeowners insurance. Don't want to "pirate" this thread (OP I too appreciate your work) wasn't there a group in TV working on a possible "self insured entity" for residents of the Villages to sort of take up the slack where insurance is lacking? Anybody know if there has been any progress on this concept? Sinkhole---always going to happen to somebody else that's what we think. Your information while not scientific, is right on the mark. The closer the sub limestone strata is to the surface, the more likely of sinkholes. Over many many years the limestone dissolves leaving a cavity. As the water table that normally fills the cavity, is depleted, and especially when the upper surface becomes wet and saturated from rains, the upper surface falls into the cavity. You then have a sinkhole.